Whether you are a seasoned SPF contractor or it is your first day on the job, there are specific pieces of spray foam insulation equipment and tools you need to get the job done right. We have published numerous posts on our blog over the last several months that address different areas of this topic, featuring advice on useful basic spray foam equipment, including a spray foam insulation machine, a spray gun, a heated hose, and a mobile spray rig. So, the question now is: do you own the proper safety tools and accessories that can facilitate your spray foam applications? with care, especially if you are the person applying it. There are many critical safety measures and precautions that you should follow if you are a spray foam insulation professional. For starters, it is important for any SPF contractor to realize the natural risks associated with the handling of spray foam chemicals. Therefore, the experts at Intech recommend that anyone working with these potent chemicals adhere to OSHA safety standards and wear the required personal protective equipment (PPE). Any team member involved in installing, or standing in the vicinity of a spray foam machine and SPF insulation application, should always protect themselves from inhaling the chemical fumes or having the foam come in contact with their skin. For complete protection, we suggest all contractors wear polyethylene jumpsuits, gloves, face respirators, and steel-toed boots for every job. Safety Goggles. Wearing goggles is a smart idea as they provide extra protection to your eyes and much of your face. Spray Hoods. A spray hood, or sock, can protect the rest of your head. These open-face protective hoods cover any exposed areas including your face, scalp, and neck. Supplied-Fresh Air. If you attach fresh-air supplied systems to you and your team members’ respirators, you can further promote safety and comfort. In a nutshell, this tactic allows you to consistently breathe in fresh air without needing to change filter cartridges often utilized in traditional respirators. Fresh Air Hood. Some spray foam applicators wear this gadget instead of wearing the combination of goggles, a spray hood, and supplied fresh air system. A fresh air hood completely covers your face and helps send fresh air throughout the entire covered area, delivering an extra degree of comfort and coolness. Warning Signs. It is critical that SPF contractors always post visible warning signs around spray areas to protect other individuals in the vicinity from contacting chemical hazards. According to OSHA, you must identify all permit-confined spaces, including crawl spaces and attics using appropriate signage. Harnesses and Anchors. OSHA also has a fall protection requirement that states that workers who operate in an area that is higher than six feet off the ground must be tied off to a structural The majority of spray foam roofing applications require team members to wear safety harnesses and tie off for fall protection. In most cases, SPF contractors should include fall protection anchors in their toolbox, including weighted anchors or parapet clamps to tie-off with the lanyards of their harnesses and to protect them from potentially dangerous fall injuries. Two-Way Radios. It is no secret that communication is key for SPF insulation jobs to be successful. While one team member supervises the spray rig, for example, another worker might be up inside a structure’s attic spraying. Two-way radios can be useful to have on-hand as to allow for coordination during SPF jobs. This form of communication can help your entire team stay on the same page, avoiding technical issues, system interruptions, and potential injuries. 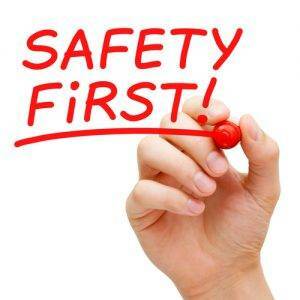 Practicing safety on any SPF job site is the most important thing we can do each day. While every spray foam job carries some inherent level of danger, taking preventative measures to ensure your safety and the safety of your team members should be a top priority. Part of establishing a safe job site is ensuring that you always have the proper safety equipment installed on your spray rig and in your toolkit. Intech Equipment & Supply offers a wide range of personal safety equipment in our online store, as well as top Commercial spray foam insulation equipment and spray foam insulation kits. We also offer resources that can help you become more informed and educate your workers about the health and safety risks of spray foam jobs, and how to avoid potentially harmful situations.